Two of my colleagues have recently returned from renewal retreats, and it reminds me again how very critical spiritual self-care is for leaders, both clergy and lay. I conducted a variety of studies on clergy wellness, morale, self-care, renewal and spiritual practice when I worked for the General Board of Discipleship, and each study raised numerous flags. I often found clergy who were “too busy” to pray (other than professionally — in church, at meetings, before meals, etc.,), have a personal devotional life, read and study scripture reflectively, attend worship that they were not leading, take vacations, exercise, and on and on. Is it any wonder we suffer such high rates of burn-out, heart disease, stress, high blood pressure, and depression. Early in my ministry, when I was a lay Director of Christian Education at a large church, I had a very simple, seemingly insignificant experience that stayed with me ever after and is a keen illustration for what I am talking about. The custodian at the church where I worked was a healthy-as-a-horse retired guy in his late seventies named Buck. Buck was strong, wiry, happy and extremely hard of hearing. While he worked, he had a Sony Walkman clamped to his belt with the volume turned to the max. You always knew where Buck was because of the tinny music leaking from his ear-phones. Along with Buck’s hearing deficiency was a tone-deafness that, unfortunately, did not prevent Buck from bursting out off-key and wailing along with his favorites, Ray Charles and Aretha Franklin. He wouldn’t sing more than a few words at a time, but he always sang him at the top of his lungs. Mercifully, he often ran an industrial powered vacuum, whose roar drowned out Buck and his tunes. Most morning’s when I was in my office, I would hear Buck set up, wail a couple lines, then the vacuum would come on and everything was swallowed up in the “white noise” of the motor. Except one morning I just kept hearing Buck — every few minutes he would bellow a phrase from a song, then quite, then repeat. I finally couldn’t stand it any longer so I went out to see what was up. Buck was blissfully pushing the vacuum back and forth, swaying to the music and singing. My eyes followed the cord of the vacuum back up the aisle, where the plug was lying on the floor under the outlet. 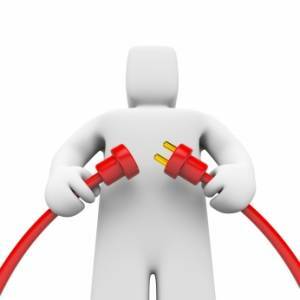 Whenever I meet pastors or laity leaders who are burned out and on the brink of giving up, the image of that plug not plugged-in comes into my memory. How can we hope to serve as a conduit through which the love of God, the grace of Christ, and the power of the Holy Spirit flows if we are not plugged into the source? We cannot give what we do not have, and if we are not connected in meaningful ways, whatever good we have to give will simply be exhausted. We live in a culture where words are given too high a value. We do not live in an oral culture any longer — nor is it merely a visual culture. We live in an interactive culture where people are attending not just to what they see and hear, but to the meta-messages of behavior and values. What is our witness as church leaders if we are constantly sick, tired, stressed, depressed, or dealing with less significant details? What happens to our capacity to lead in a visionary and creative way when we are constantly engaged in the management aspects of leadership? Where is our authenticity and credibility when we ask people to do things we do not do ourselves — like pray, give, serve, play, rest, exercise, and learn? The “average” pastor in The United Methodist Church reads 2-5 books A YEAR, only three of them related to their faith or profession. When I conducted the survey and study, the two most frequently read books by pastors were The DaVinci Code and The Purpose Driven Life — not heavyweights by any stretch of the imagination. Only 1-in-3 of our ordained clergy read the Bible apart from sermon, class, or small group preparation. Only 2-in-4 have a regular prayer/devotional discipline, and only 1-in-7 have a regular exercise routine. 7-out-of-9 report that they do not eat as well as they should. 8-in-10 say they do not get enough rest, and a similar number report that they do not take all their allotted vacation and personal days each year. What we do speaks more loudly than what we say. We are communicating to those we lead that these things aren’t very important. Is that the message we truly wish to send? Self-care should never be viewed as a luxury. It isn’t optional for those who seek to be good and faithful stewards of the blessed gift of life given to us by God. By no means am I casting the first stone — I work 16 hour days and 60 hour weeks, eat like an unsupervised 8-year-old, am over-weight, under-exercised and sacrifice vacation days on a regular basis. Blind-leading-the-blind here. But I am working hard on other aspects of my spirituality — taking daily time for contemplation, reflection and prayer, doing devotional/vocational/spiritual reading and study, working my way through the New Testament in Greek, blogging, and walking more and more. And while I may not be a paragon of practice, I can say unequivocally that I feel so much better “plugged-in” than I do dragging along all on my own. With God’s help may I become a model and not just a talker. Thanks for your wonderful reminder Dan! Of course, when folks want us where they want us when they want us – it can get complicated. And we can always make excuses. One church I served wanted to run me out on the rails because I had the audacity to publish a “day off.” They fully expected me to be completely available 24/7/365. Our cultural propensity for production plays heavy in this regard as well. We think it strange that someone would need to nap, for instance, in the middle of the day. And many folks don’t understand the energy it takes to write sermons and plan for church vitality. We can always make excuses but all of the above signals our need to stay plugged in. Clearly, we need a week-long seminar on “How To Take A Vacation”. Nothing requires more discipline, though, than not talking shop. I don’t suppose these are things taught in seminary. It’s unfortunate. We have pastors who keep going at an unsustainable pace. Spouses don’t always feel like they can say something because the pastor is doing God’s work. I hope pastors read this post and reflect on ways they can take care of themselves better. Taking care of themselves ultimately takes care of the church. It brings into question the role of the clergy and the relationship with the laity. Didn’t Jesus die on the cross so pastors didn’t have to? Or something like that.